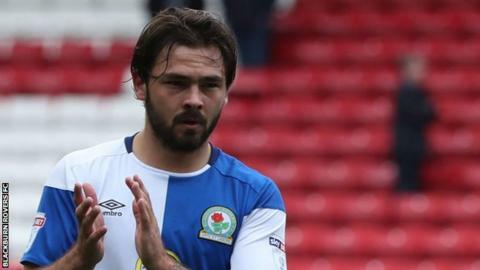 Blackburn attacking midfielder Bradley Dack is talented enough to play in the Premier League one day according to manager Tony Mowbray. Rovers signed Dack from League One rivals Gillingham for £750,000 on an initial three-year deal in June. The 23-year-old has scored three goals in 12 appearances, including in their 3-0 win against Portsmouth on Saturday. "When you watch him, he's our most technically gifted footballer," Mowbray told BBC Radio Lancashire. "He can shift it on to both feet and hit without thinking. He undoubtedly has the talent to play at the highest level." Mowbray warned that the former Gills man needs to understand what it will take to break into the top flight. "He's a wonderful talent. He's a nice lad and I'm trying to make him aware of the professionalism required," the 53-year-old continued. "If he wants to make it in the Premier League one day, hopefully with this club, then you have to give your life to football, work hard, sleep and eat right."